Combination of our PFS and Toe Stilt styles. The articulated Plantar Flexion Stop limits plantar flexion with rigid dorsiflexion to maintain the prescribed position of the foot. Recommended for the complex clubfoot. This device is also good for children with hyperflexible feet as it ensures the foot is always held in a neutral or dorsiflexed position. The Toe Stilt is a dual purpose AFO designed to support the Ponseti method of treating clubfoot. The AFO can be worn attached to the Ponseti® Bar in accordance with the standard Ponseti bracing. It can also be worn for short periods outside of regular bracing times in order to help the patient maintain good dorsiflexion by stretching the Achilles tendon and helping to keep the foot flexible. This is achieved by the placement of a severe wedge permanently attached to the front of the AFO which has the effect of the feet always being in a dorsiflexed position of 10 degrees when standing. 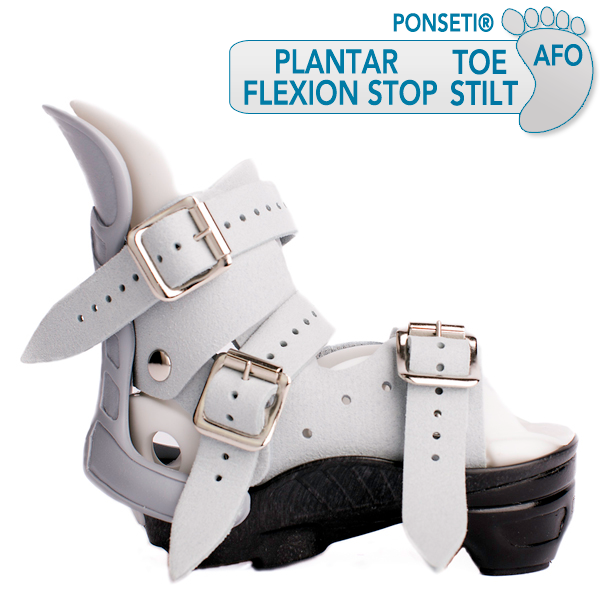 The patient must be ambulatory in order for the Toe Stilt AFO to have any effect when used without the Ponseti® Bar. Available in sizes 2 through 11 in gray, pairs and singles.